Posted on July 3, 2012 by Sarah S.
I knew I wanted a bulletin board over my vanity/desk. I liked the idea of fashionable images that will help inspire my morning wardrobe choices. I also knew that my jewelry didn’t belong on my vanity (that is way too cluttery for my taste!). 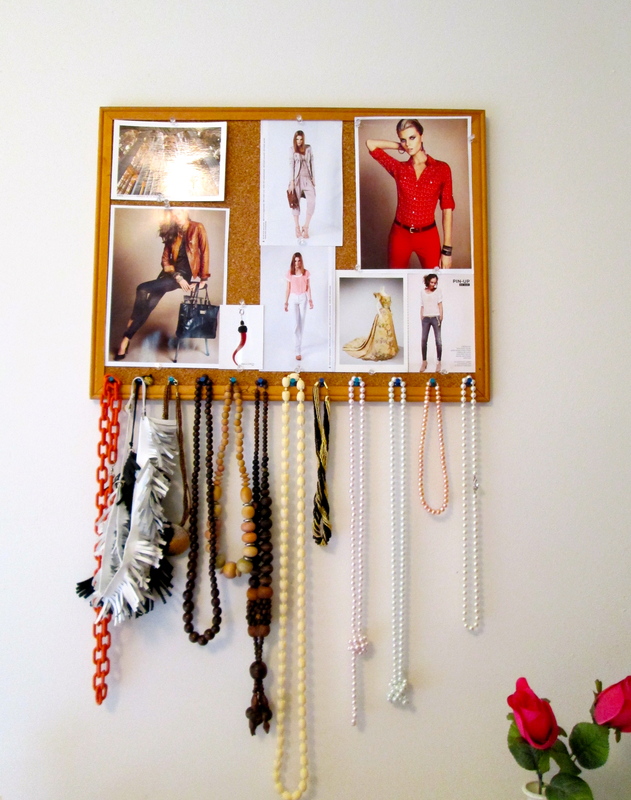 My sister came up with the idea of hanging necklaces and bracelets from tacks at the base of the bulletin board. The idea is simple, but I think the result is striking (not to mention extremely cheap). The cost for this project? What are some good jewelry organizer ideas you’ve ran across? This entry was posted in DIY & Tutorials and tagged affordable home decor, budget, bulletin board, cool home decor, DIY, diy projects, do it yourself, fashion, home, home decor for less, home decor how to, home decor ideas, home decorating, interior design ideas, interior design tips, jewelry, mia prima casa, organization, organizer, project, shabby chic home decor, trendy home decor, vintage home decor. Bookmark the permalink. Thanks! What a beautiful blog you run, btw!